This Heavy Duty Jerry Can Holder is used widely with the Jayco range of Camper Trailers, Pop Tops and Caravans but can also be fitted to most RV A-Frames. It's used to carry 20L jerry cans of water or fuel and includes a lockable chain. 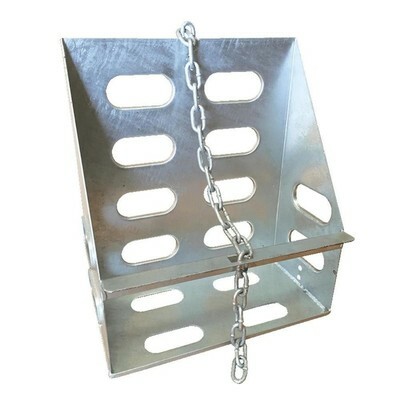 The Jerry Can holder includes 2 bolt holes on each side which can be used to fix to an A-Frame using angled brackets but please note the brackets are not included. A commonly used bracket is Jayco part number C1095A. Notes: The dimensions of these jerry can holders are best suited to the metal jerry cans. Some plastic jerry cans can be too big. Check your jerry can size before buying. Good price, good quality and quick delivery from Campsmart. Very happy and extremely fast delivery. Great product. Very strong construction. Great value for money compared to other jerry can holders on the market.